If you have ever heard me speak or teach about saving money, then you have undoubtedly been introduced to on-line banks. I’m not talking about banks that have websites but about banks that have little to zero physical “bricks & mortar” locations. I’m talking about banks like Capital One 360 (formerly ING Direct) and Ally Bank (built on the base of GMAC). Sub-Accounts If you have a regular savings account, all you can see is a total amount of the money the account currently contains. With on-line banks, you can create something called “buckets” or “sub-accounts” to give every dollar a designated name! This means you can create sub-accounts like “Christmas”, “Emergency Savings”, “Vacation”, “Life Insurance”, etc. 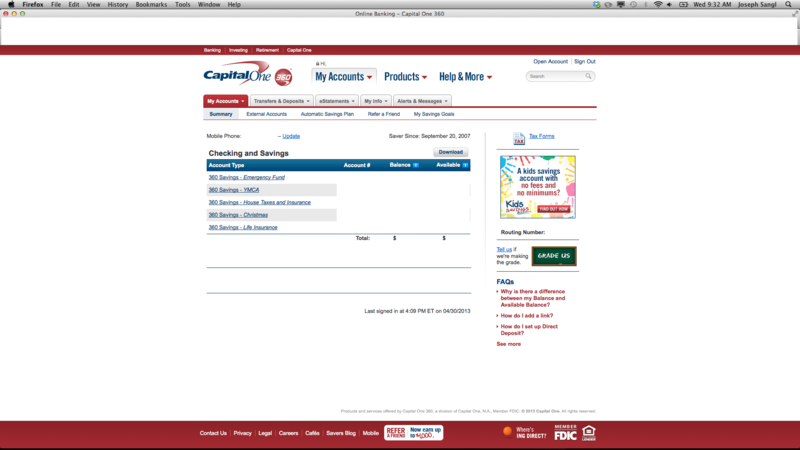 See the example screen shot below from my Capital One 360 account. You can click the image to see a larger version. This makes it so much better! Automatic SavingsYou can establish automatic transfers from another existing bank account. In the example I show below, I have set up automatic transfers for my emergency fund, YMCA annual membership, House taxes and insurance, Christmas, and life insurance premiums. It is a “set it and forget it” approach to savings that is awesome! Customer Service Because these banks only have an on-line presence, they have to be INCREDIBLE at customer service, or people would not even know about them. Every interaction I have had with my on-line banks has been an incredibly positive experience. FDIC-insured These banks are insured by the FDIC – just like any other bank. That means your deposits are protected. I like that! No MINIMUM balance This makes it perfect for any and every saver. I encourage you to check them out: Capital One 360 and Ally Bank. Set a savings goal. Then establish an automatic savings plan to help you accomplish it! Do you use any of these banks? What do you like about them most? I have a Capital One 360 account. with a couple of sub accounts. I use mine for my Emergency Fund, Car Insurance (you get an additional discount for paying in full so I save in advance of that)and Car Taxes. The car tax is a bummer of a bill when it comes in so I save just a little each month for that as well. I love having these accounts. Probably the best thing I like about it is I use to be a compulsive buyer. Well, it takes 4 days to get your money back out of your account and by then I don’t even want what I was going to purchase so it saves me some scratch on some things that I didn’t really need to start with. Thanks Joe!!! !